In 381 B.C. building began on the ‘Basilica Apostolorum’ (underneath the Cathedral). The basilica was founded on a large Roman house of the first century B.C. The church was erected to house the relics of the apostles. It was the shape of a large rectangular hall, 40 metres long and 20 metres wide, and was divided into three naves by rows of columns of which the first and the last were against the walls. The Presbytery was raised and had an apse inside the perimeter of the hall, around which it was possible to walk. 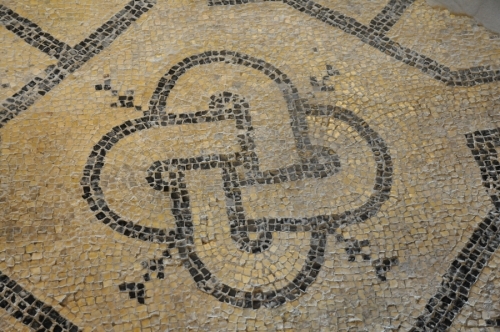 All the floor, still visible and well preserved, was decorated in mosaics; it was divided into sections where the names of donors appear and where decorative and symbolic designs alternate. Of these decorations the most noted are the crooked cross, which was the symbol of life in ancient temples, and Solomon’s knot, two interwoven rings which are unseparable. The mosaic with a large circle enclosing two smaller circles is of great interest. At the time of construction the Basilica was in communication with the Trichora by means of three doors. About the first half of the V century B.C., the Basilica underwent modifications: the construction of the solea, long corridor of 8 metres, and of two wall divisions at the side of the presbytery. The year 589 B.C. was a tragic year for the Basilica Apostolorum and for all the town. A terrible flood razed to the ground the civil and ecclesiastic buildings. The population, who had abandoned the territory, returned as soon as possible and reconstructed a second Basilica, of which remain a length of wall above and to the side of the apse of the first church. In the first ten years of X century B.C., during the invasions of the Ungari, Concordia was plundered and the second church destroyed.